Often when I am asked why I like Evernote so much I find it difficult to give a brief answer that really does the tool justice. I think this is because the usefulness of Evernote grows in direct proportion to how much you use it. So if somebody has never used the tool before, short of telling them to just try it, there is no real way to give them a good frame of reference. Sometimes I try to answer the question by explaining the main features of the tool – only to be met with a glazed over look by the person. Other times, I try to explain by showing them examples of how I use the tool. But the problem with this approach is that my needs are most likely not the same as their needs and my examples may not resonate with the core problem that Evernote could solve for them. It can also be overwhelming to look at my set up because I use so many notebooks and tags. Create 2 notebooks: Inbox and Archive. Do this by renaming the default notebook to ‘Inbox’ and creating a new one called ‘Archive’. Pick one thing that you are going to use Evernote for and commit to doing that for a week. 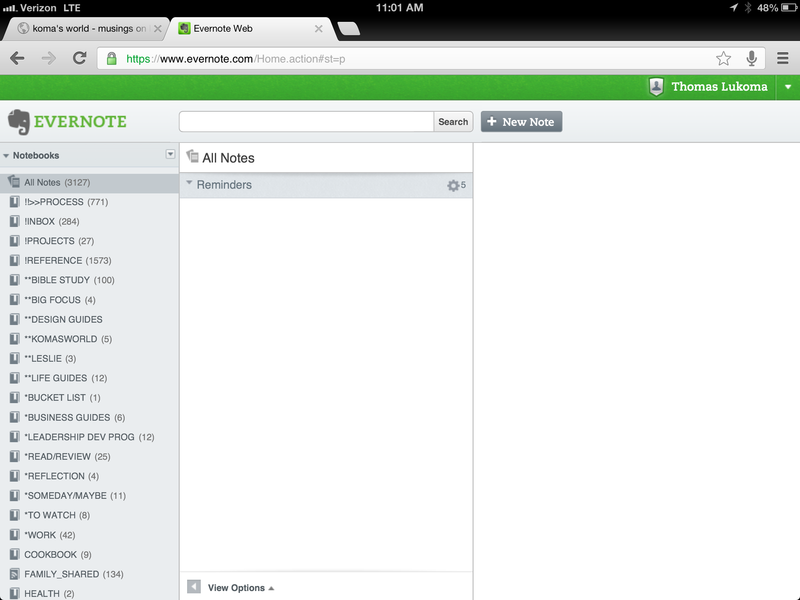 During you trial run of Evernote, if you think of other ways you could be using it, go ahead and do so. Some will be good ideas and others you will abandon. Its not a big deal because the purpose is exposure and not mastery. As you read them, try and incorporate any of the tips that look like they would be helpful to you. After your trial, post a comment on this post to let me know how it went – or to ask any questions when you need help. I enjoy coming up with creative ways to use Evernote so it wil be fun for me to research for you. You can also send me a DM @komasworld.